My friend Shelly is getting married in June, and she’s chosen a beach themed wedding. She wanted something fun, fruity, and beachy – and thought a strawberry daiquiri cupcake sounded like a good contender for her cupcake lineup. I went to work in the kitchen, and this are what I ended up with. The ones we make for her big day will be much more subdued – with more natural looking decorations. But, I couldn’t help gussying them up with a cute cocktail umbrella. Can you blame me? So, it’s a strawberry daiquiri cupcake – which is a vanilla cupcake that I spiked with some homemade strawberry daiquiri mix, and a glug of rum. They turned out moist and delicious. 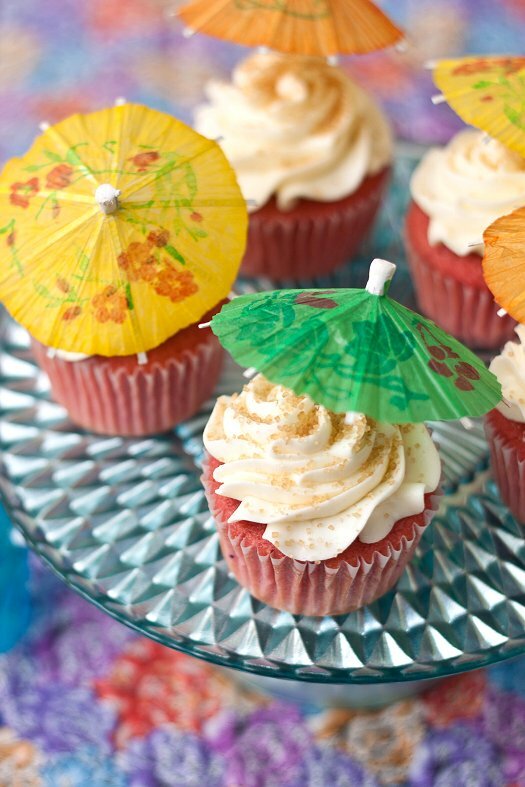 I then topped them with a rum buttercream – which was the absolutely perfect addition. Frostings are so much fun, there’s always a fun new flavor to create and experiment with! I used rum extract, as well as a little of the “hard stuff” to flavor the frosting, and I think it was a nice balance. Just looking at them makes me want the beach! Another month or so, and we’ll be taking a batch of these cupcakes to the sandbar (via boat!) to share with our friends. Come on summer! Preheat oven to 350. Line 2 cupcake tins with liners. Combine the flour, baking powder, and baking soda in a medium bowl. Whisk to combine and set aside. In a large measuring cup, combine the buttermilk, daiquiri mix, rum, and vanilla. Whisk to combine and set aside. In the bowl of a stand mixer fitted with a paddle attachment, cream the butter and sugar on medium speed until light and fluffy, about 3 minutes. Add in the eggs, one at a time, mixing well after each addition. With the mixer running on low, add the flour and buttermilk mixture in three increments – beginning and ending with the flour. Add the food coloring, if using, and mix until just combined. Divide the batter evenly between liners, filling about 2/3 of the way full. Place in preheated oven and bake for 18-20 minutes, until a toothpick inserted into the center comes out clean. Remove to cool on wire rack. To make the buttercream, beat the butter until light and fluffy. Slowly beat in the confectioner’s sugar until smooth. Add the rum, as well as the rum extract. Mix to combine. Frost cooled cupcakes as desired. I absolutely love the look of these cupcakes! They make me long for summer to get here too! So cute, love the umbrella toppers! These look great! Is that sugar or salt on top? So glad to have found this recipe! I’ve been searching for a SD Cupcake recipe that doesn’t use a mix! I made them today for my daughters Zumba party (no alcohol) and they were a total hit! Can I substitute buttermilk with whole milk? Will there be any noticeable change in the cupcakes’ texture? Thanks! Absolutely. I think it would only make it more moist! Can’t go wrong with buttermilk in baked goods.